Sharkfin™ reusable earplugs allow you to block outside noise like never before. A specially formulated self-molding silicone wraps around the ultra-soft polymer plugs and quickly molds in 5 minutes to provide you with a permanent, comfortable and effective seal. The plug’s flanged design fits all ear canals. Sharkfin™ mutes outside noise to an NRR of 30 dB and prevents irritation for hours of continual wear. Once in, your plugs won’t shift or fall out of your ears no matter what the task at-hand may be. Phthalates-free, resistant to water, UV, ear wax and body oils. 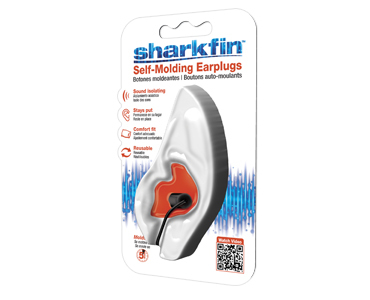 The Sharkfin™ earplug set comes complete with molding material, earplugs, a detachable neck cord and carrying case for storage after use (material for 2 plugs (+1 spare) & assembly instructions enclosed). • Mold in 5 mins.